Strandz is a private, boutique salon suite located within Sola Salons in Timonium Maryland owned and operated by Annie Zeiler. Strandz is dedicated to creating a bright, fresh, and relaxing atmosphere; while also providing clients the creation of individual and unique haircutting and coloring experiences. Annie has been honing her craft in hairdressing since 2009. 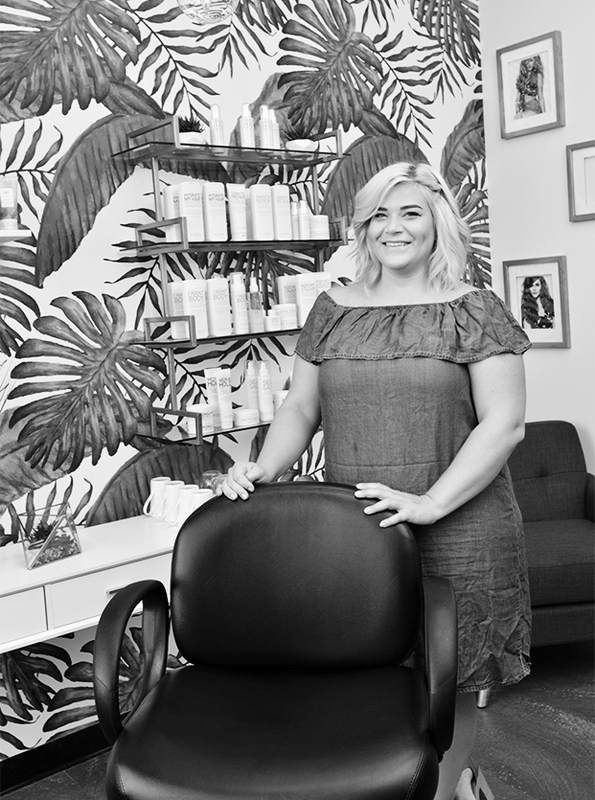 After working in one of Baltimore’s most prestigious salons for 8 years, Annie opened Strandz in August of 2017. With the opening of Strandz, Annie hopes to provide a comfortable, private salon setting in a boutique environment. With an understanding of how important the client/ stylist relationship is, she strives to provide the best cuts and colors for her clients. Annie’s past education of Art and Art Theory, allows for an understanding of shapes, movement, balance, and texture necessary to provide a customized Cut and Color experience for every guest. Continuing education has been paramount in excelling Annie’s career behind the chair. Her education journey has taken her from coast to coast, learning from the best in the beauty industry. In 2011 she had the opportunity to work with celebrity hair colorist, Kim Vo, which opened the door of balayage and advanced hair coloring techniques. Annie found her niche with hair color, and has excelled in the understanding of Color Theory, taking her on the path to work with Eufora International and Kemon as a color educator. She has always found value in sharing her knowledge and helping every stylist be the best colorist they can be. If unsure of what type of color service to book, I offer complimentary Consultations, or try to book a lengthy color service to ensure we have the proper time to discuss and achieve your look! From a dramatic change to a full refresh of your current Color, sometimes color is needed from roots to ends. FRoots are for Trees! Cover those pesky greys or regrowth that always seems too come back. Regrowth Touch Up with 4-6 dimensional highlights or lowlights strategically placed for maximum dimension. Color is applied to roots and seamlessly blended down to lighter ends. Perfect first step to get out of foil highlights and into balayage highlights. Bold and Vibrant or Pastel, fashion colors are totally on Trend. Global application of 1 or 2 colors. All Blonding Services Include Customized Gloss and B3 Brazilian Bond Builder. Want to be all over blonde?? They do have more fun! Hair painting at it’s finest. Full head application for making an impact or for first time Balayage clients. Have a special event? Or just want to treat yourself? A Blow Out styled to your liking. A light lip gloss effect of color to tone out unwanted tones or to enhance those tones your color may have lost. Just want one pop of color? Maybe 2? It’s easy with individual placement. Custom Hair Treatment designed for you, need Shine? Moisture? Protein? There’s a treatment for every hair type. A safe formaldehyde free smoothing treatment. Helps to smooth frizzy and unruly hair, while also helping to soften curl patterns for easier styling. Lasts 6-10 weeks with proper maintenance.